Tyler Parsons came out of nowhere as an undrafted OHL rookie in 2014-2015, demonstrating the potential to become the London Knights’ starter with a strong showing in 33 games. After posting a .905 save percentage, Parsons entered his draft season as the presumed starter for one of the OHL’s most famous teams. 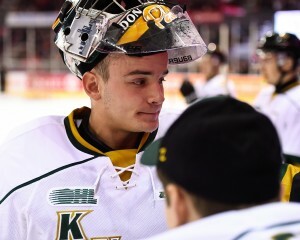 Despite entering the season as one of the biggest question marks facing the Knights, Parsons has turned in one of the finest performances of any OHL goaltender and played in the 7th-most most games league-wide. While Parsons doesn’t have the prototypical size for an NHL goalie, standing just 6’1” and weighing in under 190 pounds, Parsons more than makes up for it with what is among the best athleticism in this draft class. Parsons specializes in making spectacular saves, as he is ultra-quick when moving laterally and has strong legs to push across the crease. His impressive progression has caught the eyes of many, as shown by his invite to Team USA’s World Junior evaluation camp (although missing out on the final roster), a rarity for a pre-draft goalie. Stickhandling is a strength of Parsons’, as he can act as a third defenseman with long stretch passes and icing the puck in penalty kill situations. Despite his strong season this year, many question marks are surrounding Parsons. His numbers are extremely impressive for a young goaltender, but there has been concerns about the quality of the Knights’ high-powered offense inflating his numbers. He also should learn to reign in his game, as he sometimes can over-commit to initial shots, causing him to be out of position on second and third chances. The top NHL goaltenders are often lauded for being calm and keeping their composure in the crease, and Parsons could become a star if he learns to do the same. Parsons came out of almost nowhere to become a top prospect at the position, but he has his share of critics as well. Though technically sound and one of the most athletic goalie prospects in his class, Parsons’ size and relatively easy role as backstop to the high-powered Knights offense could give teams pause in June. However, Parsons has the tools and athletic ability to develop into the best goalie overall in this draft class. Many questions have been raised over the quality of Parsons’ team inflating his impressive rate stats, but his resume speaks for itself. Not only is he putting up solid numbers, but his athletic ability and massive improvement this season has cemented his status as one of the first goalies off the board. Expect to see Parsons selected anytime between the late second and early third rounds. An average sized netminder by NHL standards, Parsons has been mostly terrific this season, using his quickness and athleticism to make big saves, night after night. But the OHL playoffs will be another story for Parsons. His performance in the post season will go a long way in determining where he’s drafted. …Lightning-quick goaltender, reflexes are outstanding, and he’s got excellent recovery. He’s not quite as big as we want him to be for a goaltender, but he’s right on that edge where he makes up for it with his quickness. He’s got a great glove hand; when he’s on his game, he’s nearly impossible to beat because he has good positioning and he’s so quick, his reflexes are so quick, he’s gonna stop the rebound as well… He’s been doing a little bit of everything for London this year. Parsons put together one of the finest goaltending seasons the Knights have seen recently, but he will need to reign in his game if he hopes to succeed as a workhorse NHL starter. However, his athleticism and playoff performance are promising signs he can become an NHL starter. Tyler Parsons wasn’t drafted into the OHL, he was instead taken 30th overall in the 2014 USHL Draft. However, he chose not to report and instead signed with the Knights as a free agent following the 2013-2014 season.